A Calgary vacation is perfect for nature enthusiasts and families looking to spend time together. Explore everything from snowmobiling and skiing to energetic festivals and fairs with food and crafts. Calgary has a thriving theater culture with endless options for entertainment. Clubs and lounges offer fun nightlife options. Plus, Calgary is known as the gateway to the Rocky Mountains, meaning adrenaline junkies and explorers will find thrills and more. 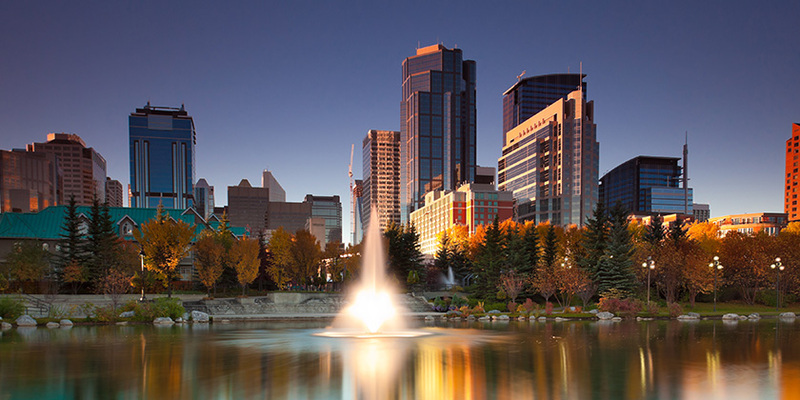 Hop on a flight with United Airlines® and discover everything Calgary has to offer today. In just over 2-Hours, you'll travel through a variety of Banff landscapes, giving you the best chance to observe animals in their natural environment. While in Banff, enjoy a mild whitewater-rafting trip on the Kicking Horse River, the premier rafting river in the Canadian Rockies. Enjoy bird's-eye views of the Canadian Rockies as you soar high above and around them in a helicopter! Discover the Canadian Rockies' favorite resort town and its beautiful environment on a 4-hour guided tour of Banff. Resort info: Located on the exciting Stephen Avenue Walk featuring restaurants, shopping, and theatres. A premier luxury hotel offering upscale accommodations. Resort info: One of the top downtown Calgary hotels located near eclectic shopping, fine dining and world-class corporations. Resort info: Family friendly Calgary hotel is located near beautiful downtown Calgary and close to the Calgary International Airport. Resort info: Location isn't everything, but it's a big part of what keeps guests returning to our spacious, stunning Calgary hotel.